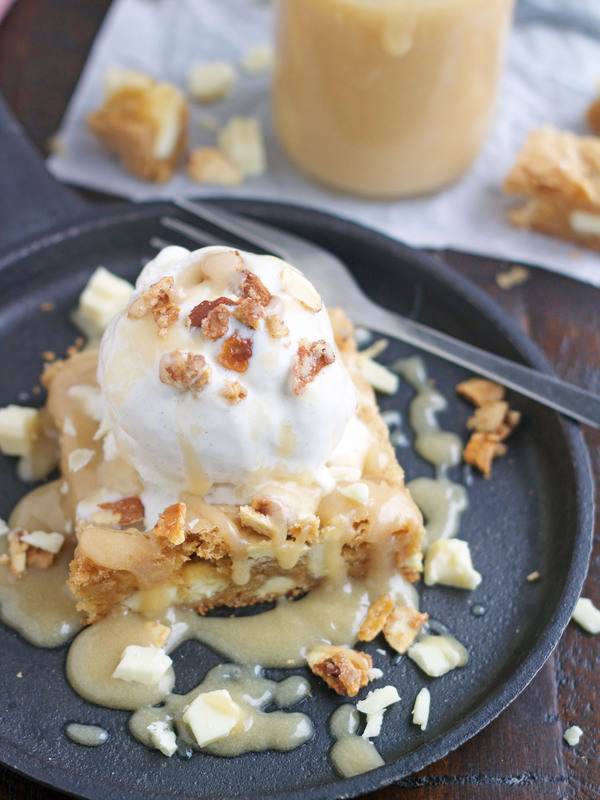 These White Chocolate Blondie Sundaes are a delicious chewy blondie filled with white chocolate chunks, served warm and topped with ice cream and rich maple butter sauce. They’re amazing! First off, my apologies for not getting a new menu plan posted last Friday. I’ve just been trying to get last minute things done for my son’s wedding tomorrow, and I just ran out of time. I promise I’ll get one posted this week. Yikes, my son gets married tomorrow!! I’m so excited for him and super sad at the same time. Oh, and of course we’ve had amazing weather with literally no rain for weeks and weeks, and it’s supposed to be windy and rainy on Tuesday. . . seriously I’m so bugged! Enough of that, now let’s talk about how these White Chocolate Blondie Sundaes are just plain ridiculous. If you’re an Applebee’s regular, these might look a wee bit familiar. They’re a knockoff of their White Chocolate Blondies, but these might possibly be even better. Ok, let’s be honest, they are!!! Maybe some of you are thinking blondies just aren’t your thing, but I promise you after one bite, these WILL become your thing. These are rich, buttery and loaded with chunks of white chocolate. I could totally eat the entire pan just plain, but then add a scoop of vanilla ice cream and pour the maple butter sauce on top . . . . heaven help me! If you’re feeling adventurous, top these off with some sugared almonds and/or toffee bits, you won’t regret it. Pleeeease make sure you use a good quality white chocolate bar in these. I use the Lindt white chocolate bars. Now if you’re really desperate then I guess you can use white chocolate chips in place of the chocolate bar. I mean desperate times call for desperate measures, right? I really highly recommend the white chocolate bar though. This is such a fabulous dessert, and even though it’s not loaded with milk and/or dark chocolate, everything about it is perfection. 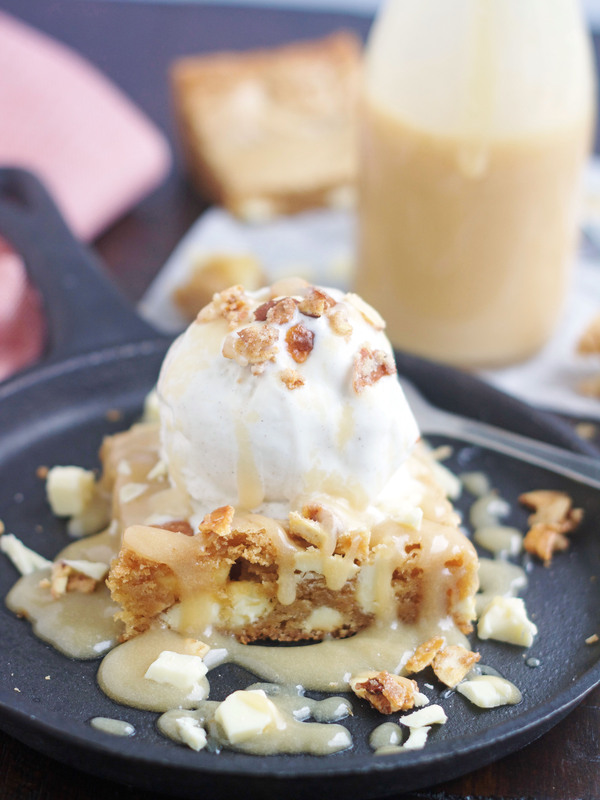 A buttery, chewy, warm blondie, topped with ice cream and topped with a delectable maple butter sauce poured on top. . . . are you catching my drift? Promise me you’ll make these. Preheat oven to 350 degrees. Spray an 8-inch baking dish with cooking spray and set aside. In a large bowl, beat the egg, brown sugar, butter and vanilla. Add the flour, salt, baking powder and baking soda. Mix until well combined. Stir in chopped white chocolate. Spread prepared baking baking dish. Bake at 350° for 18 to 22 minutes or until a toothpick inserted in the center comes out with moist crumbs (do not overbake!). Melt butter in a saucepan on medium heat over medium low heat. Whisk in sugar, maple syrup, and brown sugar and salt. Add cream cheese and stir frequently until melted and mixture is smooth. 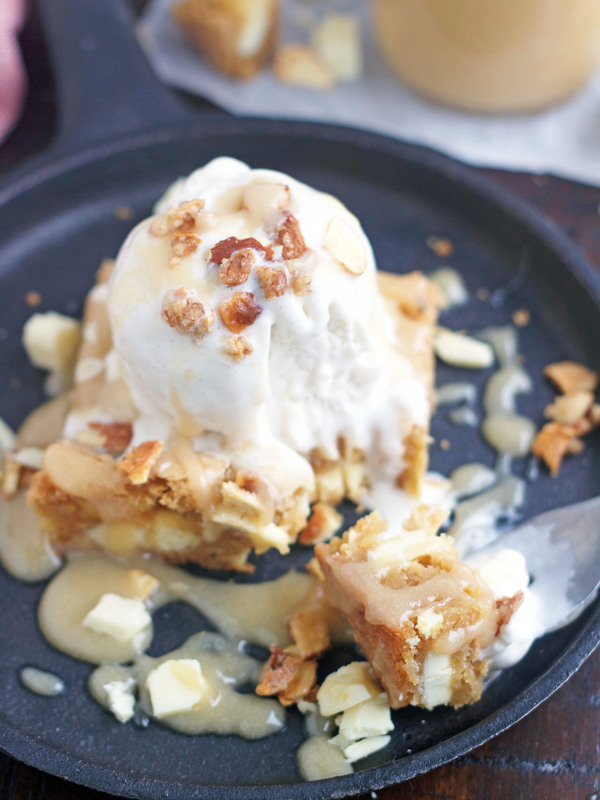 Cut blondies into squares, top with a scoop of vanilla ice cream and sauce. You will have leftover sauce, so feel free to half the recipe if you want to. I just keep the leftovers in the fridge and use it over ice cream even after the blondies are gone. These look fantastic and I really love white chocolate. So exciting for your son’s wedding! It will be a wonderful day and many special memories will be made! Congratulations. I hope you post a photo!!! Hi Teresa! It’s great to hear from you. 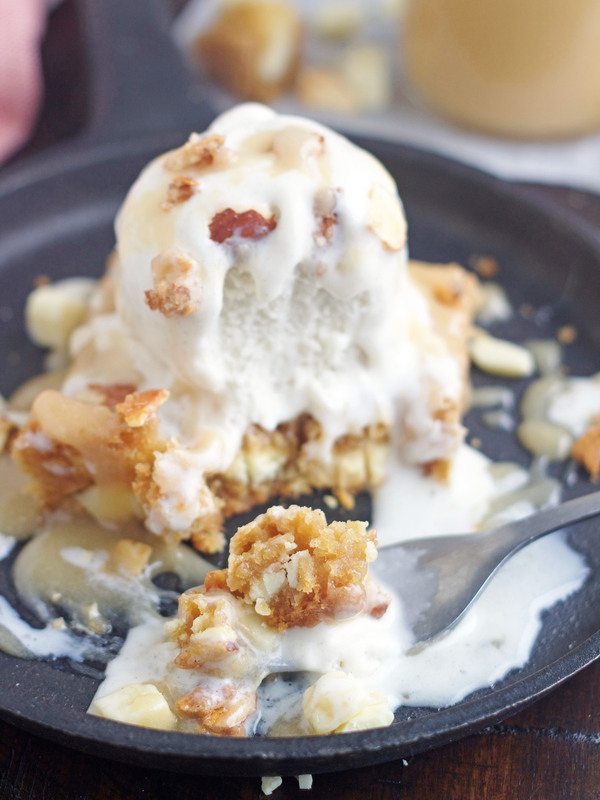 These blondie sundaes are seriously delicious, I hope you have a chance to make them. The wedding yesterday was amazing, well except for the rain, right when we DIDN”T want it . . .ugh! I’ll share some pictures in the next few days. Take care.